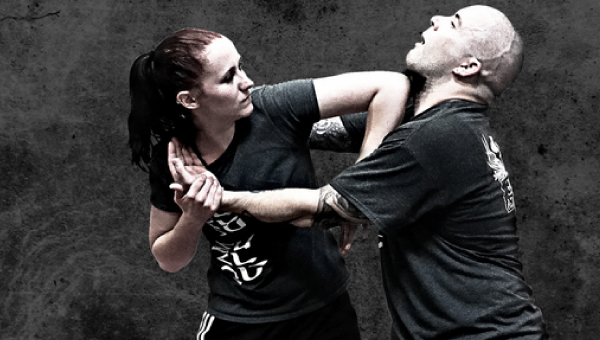 Krav Maga promotes finishing a fight as quickly as possible. Attacks are aimed at the most vulnerable parts of the body, and training is not limited to techniques that avoid severe injury. Drills provide maximum safety to students by the use of protective equipment and the use of reasonable force. Students learn to defend against all variety of attacks and are taught to counter in the quickest and most efficient way. Counter attacking as soon as possible (or attacking pre-emptively). Maintaining awareness of surroundings while dealing with the threat in order to look for escape routes, further attackers, objects that could be used to defend or help attack and so on. Basic training entails a warm-up, learning essential pressure points, and learning how to approach and control an opponent using force. Students learn how to execute strikes including various punches, hammer fists, elbows, knees and kicks. Students learn defenses against take-downs, chokes, bear-hugs, arm bars, and other possible attacks. Training also includes learning to defend against various weapons such as knives, bats & guns. Pressure drills in which students engage with multiple attackers are also common. Other training exercises and pressure drills include students closing their eyes and reacting to a variety of potential threats. Fitness and endurance training is also incorporated into regular classes. Training can also cover situational awareness to develop an understanding of one’s surroundings, learning to understand the psychology of a street confrontation, and identifying potential threats before an attack occurs. It may also cover ways to deal with physical and verbal methods to avoid violence whenever possible.